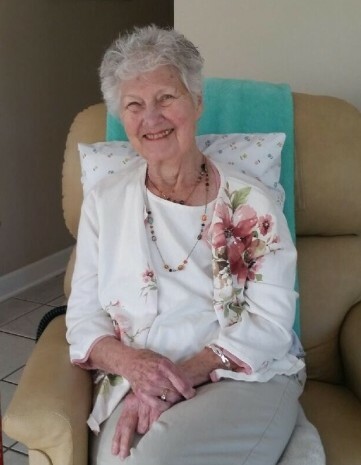 Betty Lee Robbins Durrance, age 90, of Santa Rosa Beach, FL, passed away at home on April 7, 2019. Born on November 18, 1928, in Tampa, Florida, she was the daughter of John Dee Robbins and Mildred Moore Robbins. For the past five years, Betty lived with her daughter in the South Walton beach area where they have enjoyed the relaxing beach life. As a child growing up in Tampa in the 30’s and 40’s, Betty enjoyed creating escapades of often hilarious mischief with her adored and beloved younger sister, Bobbie. One of the families favorite stories is of their catching and putting ants into self-made matchbook hospital beds where they attempted to bring the ants back to “health”. Betty remained active all of her life; doing aerobics with her grandchildren when they were young; traveling, hunting and gardening with her husband, Wilbur; and power walking the North Georgia hills with her friends. She stayed physically fit into her late 80’s by riding a red 3-wheel bike with a friend in Blue Mountain Beach. Betty was well known for her beauty, grace and natural elegance. She was a very bright and thorough accountant during her professional years. She was a lifelong learner, enjoyed how-to books and was rarely without her dictionary. Always a practical problem solver, she continually impressed those around her with her thoughtful analysis, common sense and intelligence. She was a composed and charming Southern Lady who had a natural ability to put others at ease while displaying an uncanny understanding and comprehension of other’s needs — whether they be spoken or unspoken. A caring mother, grandmother and great-grandmother, she is predeceased by her son, Michael Norton, grandsons, Micha Biblis, and Paul Caron, and husbands E.S. Norton and Wilbur Durrance. She is survived by her daughters, Sharon Slaton, Pam Norton, and Randi Bradley; sister, Barbara Gray; seven grandchildren, Christopher Biblis, Charity Camacho, Christine Yerby, Nat Rudulph, Jesse Norton, Jake Norton and Max Norton; and 16 great grandchildren.